Especially whilst Schurrle was on the pitch, rotations between the ‘3’ of Wolfsburg’s 4-2-3-1 were common. The most frequent rotation in this aspect was between Kevin De Bruyne and Andre Schurrle which happened commonly when the Wolves had possession. The impact of this was inconsistent, as in positive cases De Bruyne found space alone to combine with Rodriguez on the left flank. However even in these moments it could be argued that the Belgian’s vital central presence was missed. Andre Schurrle had quite a poor game in general, as he was taken off at half time in place of Trasch. In one or two attacking plays, he stayed quite high up with Bas Dost and was able to create a couple of threatening situations following direct play to the target man. After combining with the potent forward however he was unable to capitalise on some quite open chances. Alternatively, the German forward dropped deep into midfield as the ball was with Knoche and Naldo. In these situations, his presence disrupted the development of possession, as he lacks the understanding to support sufficiently and in a few cases lost the ball to Inter’s impressive midfield pressing. This contrasted quite significantly to the same moments featuring De Bruyne dropping, as he supported well instead. The Belgian had impressive intelligence to display much better decision making than his teammate. Another feature of Hecking’s attacks, were overloads on the right side of the pitch. 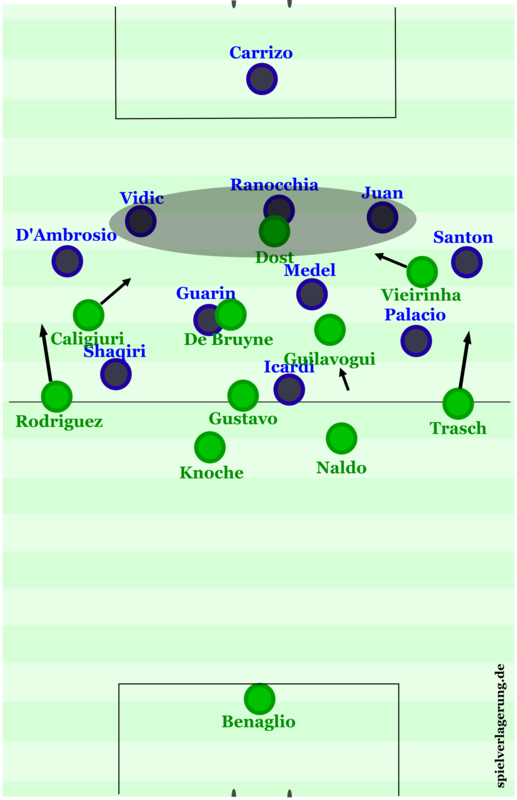 This was usually created with De Bruyne making movements to this side, with Vieirinha offering variable movements (to the touchline or inside) and situational involvement from the centre-back. Wolfsburg’s shape when focused on the right third of the pitch. In these moments, the Wolves could either progress through combinations, or by dragging Inter in to capitalise in the open space in the middle. In the combination plays, it would often free a player to cross into the threatening Dost, which was commonplace in the home side’s attacks throughout the game. On the other hand, Guilavogui would be on hand to drive into the central space created by the overloads which dragged Inter’s midfield to the touchline, whilst Gustavo sat deeper. 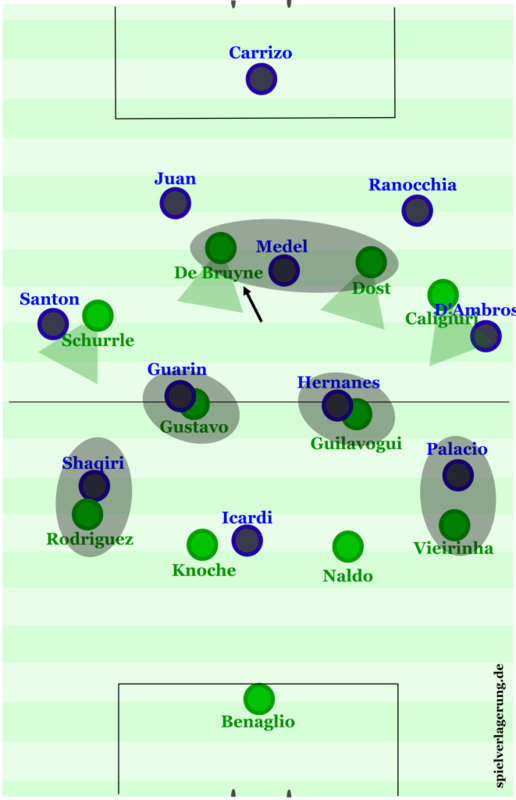 Wolfsburg had considerable dominance in wide positions, which most likely lead to their focus on creating these situations throughout the game. This dominance was achieved somewhat through a higher quality of players, as Rodriguez was unsurprisingly beating Shaqiri on a consistent basis whilst Schurrle was inside drawing the D’Ambrosio away. Meanwhile on the right, Santon was struggling to defend against Caligiuri, typifying a poor defensive performance from the Italian full-back. The support of Vieirinha cannot be overlooked either, whose movements were difficult to follow. This is not to say that the home team were entirely focused on the wide areas of the pitch, as their flexible 4-2-3-1 still allowed them to maintain a good degree of control in the centre too, which is critical to nearly any performance. This flexibility was primarily down to De Bruyne’s movements which were variable and in most directions, as he showed off his versatility in different areas of the pitch. With Inter fielding attack-minded wide forwards who were both high in their positioning, Hecking likely saw that this would potentially be an area of weakness for his opponents as the full-backs were poorly supported. On top of this, Dost threatens well when receiving from wide areas and if he doesn’t get on the end of it, De Bruyne follows up equally as good. Roberto Mancini devised his team to be quite focused on a man-marking system, to which Hecking had an interesting response. With Naldo and Knoch both relatively adept on the ball, they were used quite often as the free man to drive upfield into the space created. Naldo and Knoche often drove up as the free man due to man-marking. From this, the centre-backs utilised their passing range to make penetrative passes where the team would otherwise struggle. A common route from the centre-back was a switch to the opposite wing which was often the most open pass as every player closer to the ball was covered strictly. Before the game, Mancini discussed his gameplan of looking to press the opposition high, in an attempt to disrupt their possession game. This worked near-instantly, as they regained the ball high in Wolfsburg’s half to switch excellently for Palacio to open the scoring early on. This was often based upon the man-marking, especially in midfield with Guarin and Hernanes on the two Wolfsburg CMs, whilst Medel followed De Bruyne actively. Their midfield pressing was particularly impressive which led to the centre-backs taking on the responsibility of progressing the ball as I stated previously. The Chilean Medel was always the deepest of Inter’s triangle. Although he didn’t often drop directly between the centre-backs, he was in charge of supporting Juan Jesus and Ranocchia as Inter were bringing the ball out. The defensive midfielder would also make movements wide in some situations, for example if the shape required balancing. Further up-field, Guarin and Hernanes rotated the role of moving high as a situational 10 as the other sat. This caused some issues for the Wolves, as Guarin in particular found space centrally, however this situations weren’t exploited as the Colombian showed poor intelligence in his decision making. Inter found themselves in some issues during moments of their 1st phase of possession. This was often based around the deep positioning of the full-backs, possibly out of fear of wide counters from Schurrle and Caligiuri. 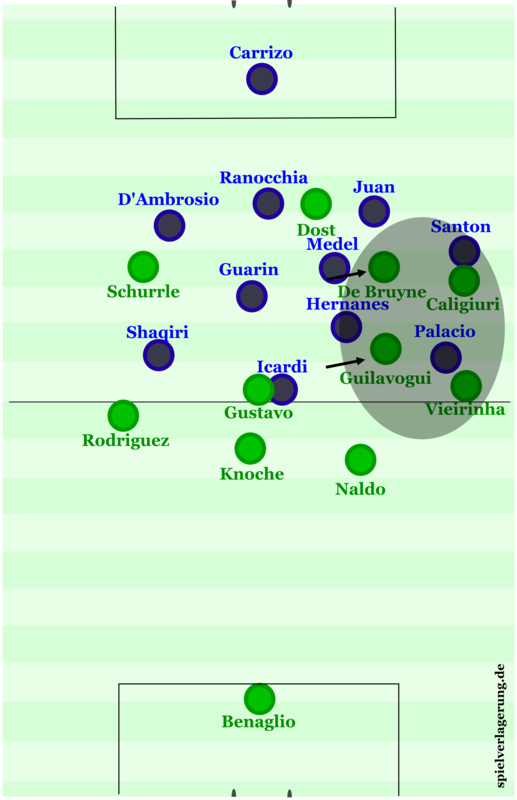 Because of this, Guarin and Hernanes were required to make movements towards the touchlines, leading to a lack of control in central areas, whilst the shape became slightly unbalanced. This being said, Wolfsburg pressed particularly well in their 4-4-2 block, with the midfield doing well to reduce Inter’s ability to develop strong attacks whilst the poor intelligence of Guarin lead to a number of attacks failing for the away side. 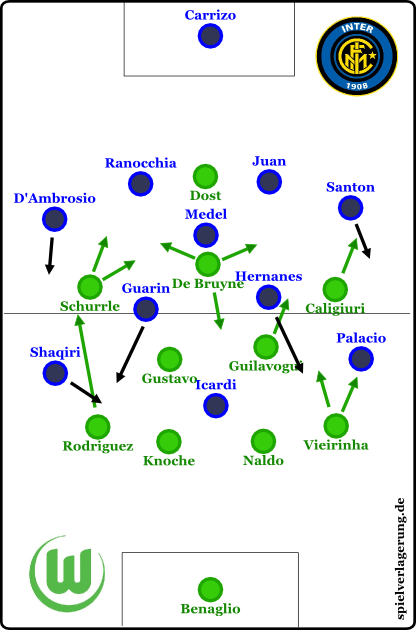 Wolfsburg featured frequently in a 4-4-2, as De Bruyne moved up onto the same line as Bas Dost; this was a more common occurrence when reacting to Medel’s positioning closer to the centre-backs. Wolfsburg’s 4-4-2 pressing with man-orientations and cover shadows. In this 4-4-2, the front four were looking to cover any passing options from Inter’s deeper players into midfield, which they did so to decent effect. Meanwhile, the Italian’s central midfielders were followed closely in man-marking by Guilavogui and Luis Gustavo. Especially in their pressure during Inter’s early possession, Hecking’s side were based heavily on man-marking. This caused some issues however Inter looked to counteract this strategy by having Icardi drop slightly into midfield where he could create overloads as the free man. In addition to this, Shaqiri sometimes came inside into the channel between Schurrle and Gustavo. With the attacking partnership of Andre Schurrle and Ricardo Rodriguez in the first 45, the Wolves were quite open down the left side in transition after losing the ball. This was used often by Shaqiri who broke quickly down this side to support Icardi higher. Early on into the second half, Mancini changed the shape of his side with an extra centre-back in Vidic coming on for Hernanes. This was for reasons unbeknownst to me as it provided little benefit for the away side. Out of possession, the away side were set up in a 5-4-1 shape with Santon and D’Ambrosio deeper. Situationally it became a 5-3-2 with a wide player moving up to support in the press. With Inter overcommitting in the back line, the Wolves were basically handed the opportunity to exploit central dominance by Mancini. This was done particularly well by De Bruyne, who improved off of his first half performance to deservedly win the man of the match award. Guilavogui helped in this feature of Wolfsburg’s attacking in the second half, as his movement ahead of the ball allowed such overloads to be created. One of the most confusing aspects of this change, was that it often lead to the Inter full-backs being isolated against Wolfsburg who attacked in pairs on the wings. These situations were more often developed from when the outside midfielders for Inter were dragged inside to deal with central developments, leaving the switch wide beneficial. This was so even despite their threats out on the touchlines previously, where Dost had nearly capitalised on a number of crosses. In conclusion, it is easy to say Wolfsburg deserved their victory completely, though they needed some examples of brilliance from star man De Bruyne at times. Hecking’s side are proving to be one of the contenders to win the cup, especially if they keep up such performances. Mancini’s Inter on the other hand, will have to make an excellent turnaround back home or risk their season being over following poor performances in their domestic competitions.